Showing items in category Australia, sorted by newest listed first. AUSTRALIA - 1930 5d on 4 1/2d violet JOHN ASH mint imprint pair. SG 120. 1930 'Five Pence' on 4 1/2d violet surcharged JOHN ASH imprint pair (light overall toned gum) from plate 3 showing the 'N over N'. SG 120. AUSTRALIA - 1914 2d 'OS' perforated 'roo' on cover to UK used at MELBOURNE. 1914 (APR.30.) Government crested envelope addressed to UK complete with the original contents bearing 2d grey 'roo' adhesive perforated 'O.S.' (small type) and tied by MELBOURNE/VICTORIA cds. AUSTRALIA - 1900 inward 'Boer War' cover from ARMY P.O. S.AFRICA. 1900 (FE.7.) 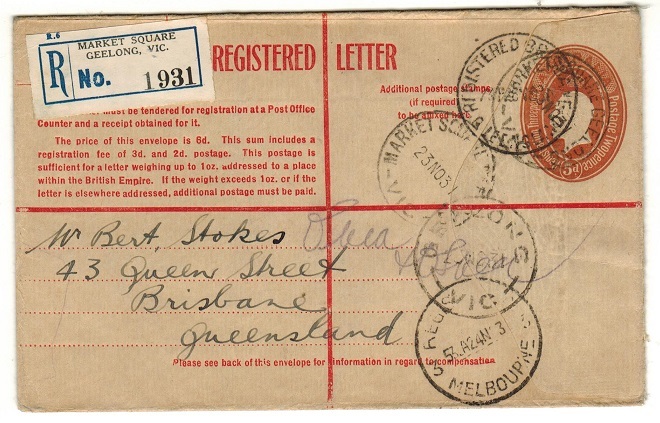 cover addressed to New South Wales in Australia bearing 'GB' QV 1d lilac strip of three tied by BRITISH POST OFFICE/BRITISH ARMY P.O. S.AFRICA cds's and with SYDNEY transit and ROCKDALE/NSW arrival b/s's. A scarcer Boer War use by one of the New South Wales Contingents. AUSTRALIA - 1940 1d rate local cover struck by 'MIL CAMP/NSW' h/s. 1940 (FEB.23.) 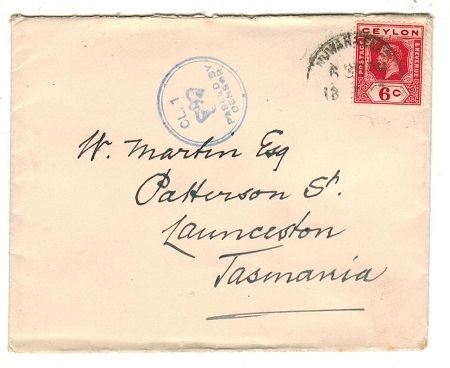 cover addressed to Tasmania bearing 1d adhesive tied by SYDNEY/MINIMUM LETTER slogan strike with violet circular MIL.CAMP/N.S.W. cancel below. AUSTRALIA - 1944 1/6d rate concessionary cover to UK used at MIL.HOSPITAL HEIDE. 1944 (JY.21.) 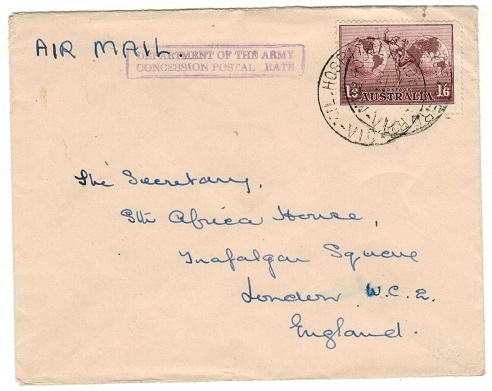 cover addressed to UK bearing 1/6d adhesive tied by scarce MIL.HOSPITAL HEIDE cds of Victoria with violet boxed DEPARTEMENT OF THE ARMY/CONCESSION POSTAL RATE h/s at left. AUSTRALIA - 1943 stampless local cover with '1d RED CROSS JUNIOR' label applied. 1943 stampless 'YMCA' envelope addressed to Bowenaville in NSW (faults-somewhat aged) struck by violet boxed AUSTRALIAN IMPERIAL/FORCE/PASSED BY CENSOR/45 h/s with scarce red on white rouletted JULY 31st/RED CROSS JUNIOR/COMPETITION/1d VOTE 1d label at lower left and counter signed. Complete with original letter from Sergeant Harvey in Victoria. The label is one of three covering the Miss Red Cross/Red Cross Baby and Junior Red cross series. AUSTRALIA - 1943 1d rate green 'ACTIVE SERVICE' cross censored envelope used at P.O.BONEGILLA. 1943 (NO.22.) 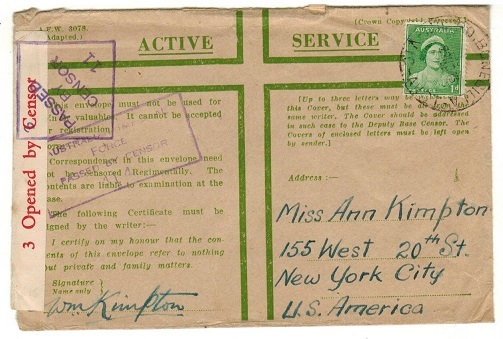 use of green on buff A.F.W.3078 ACTIVE SERVICE (green cross) envelope addressed to USA bearing 1d adhesive tied by P.O.BONEGILLA/VIC.AUST cds with violet boxed AUSTRALIAN IMPERIAL/FORCE/PASSED BY CENSOR/414 h/s additionally with red on cream OPENED BY CENSOR 3 label at left tied on front by violet 3/PASSED/BY/CENSOR/11 h/s. AUSTRALIA - 1942 4d rate 'UNIT POSTAL SECTION/S.77' cover used locally. 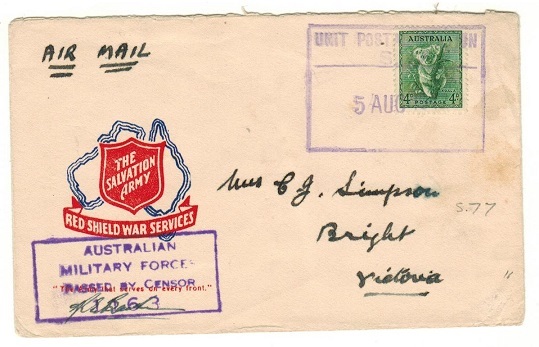 1942 (AUG.5) illustrated 'The Salvation Army' cover addressed locally to Victoria bearing 4d adhesive tied by large violet boxed UNIT POSTAL STATION/S.77 h/s from HQ 5 bn. 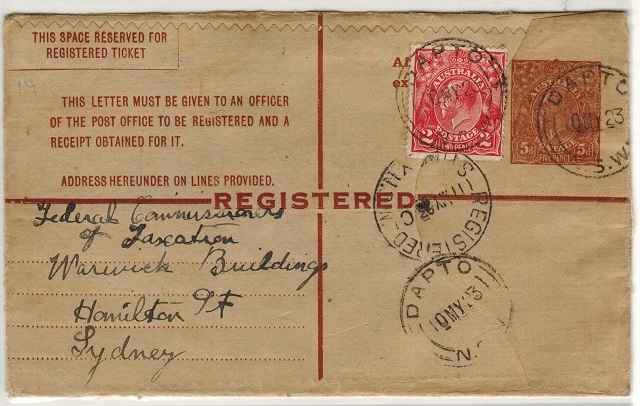 Violet boxed AUSTRALIAN/MILITARY FORCE/PASSED BY CENSOR/1163 strike at lower left. 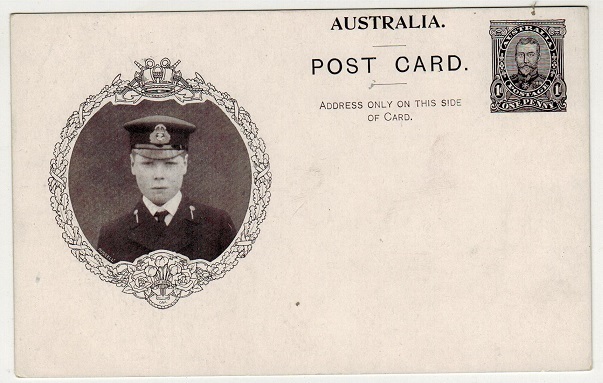 AUSTRALIA - 1913 1d rate postcard use (crease) to UK used at 'TPO No.3/ S & W R DOWN'. 1913 (MY.19.) 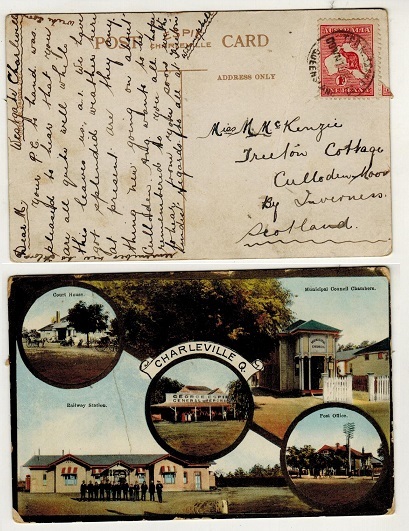 use of picture postcard addressed to UK depicting 'Charleville Q' (vertical fold) bearing 1d 'roo' tied by T.P.O.No.3 S & W R/DOWN - QUEENSLAND railway cds. AUSTRALIA - 1915 1d rate military cover used at ULVERSTONE/TASMANIA. 1915 (MR.20.) 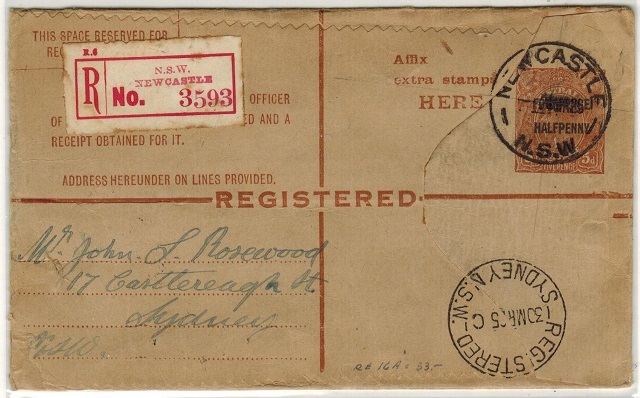 cover addressed to 'The O.C.Commanding' at D Company, 91st Infantry at Ulverstone in Tasmania bearing Australian 1d red 'head' adhesive tied by ULVERSTONE/TASMANIA cds. Includes a photocopy of Lt. R.E.Smith of the Tasmanian Rangers. 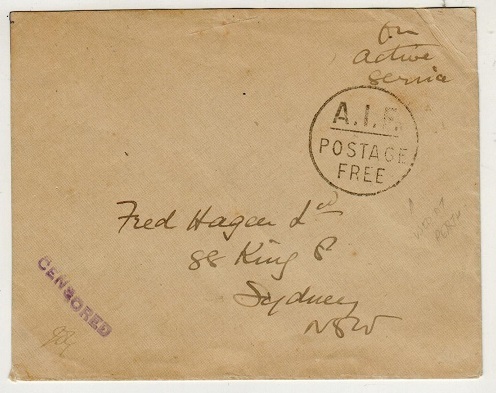 AUSTRALIA - 1916 stampless 'A.I.F./POSTAGE FREE' censored cover to Sydney. 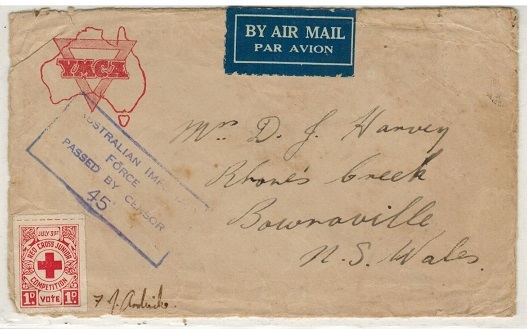 1916 (circa) stampless cover addressed locally to Sydney marked 'On Active Service' in manuscript and struck by black circular A.I.F./POSTAGE/FREE h/s (Australian Imperial Forces) with violet straight lined CENSORED h/s at lower left. 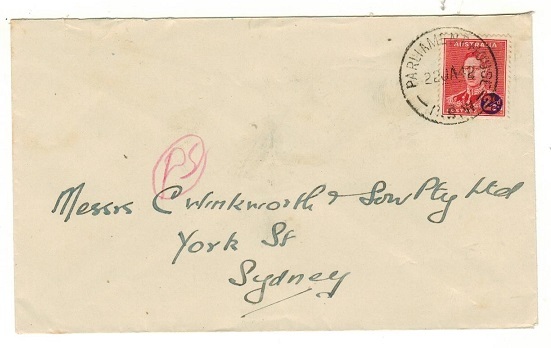 AUSTRALIA - 1916 (circa) inward cover from Ceylon with crowned CL.1 censor h/s applied in Tasmania. 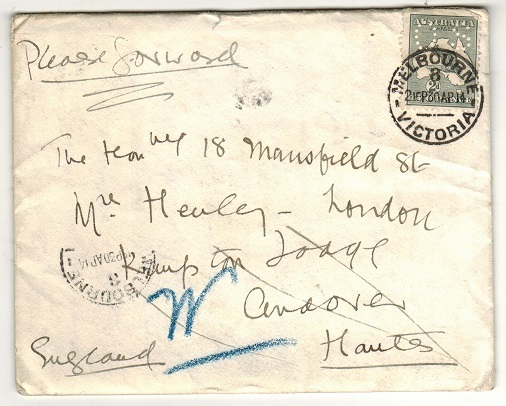 1916 (circa) inward cover from Ceylon bearing 6c adhesive tied NUWARAELLY with blue circular crowned CL.1/PASSED BY/CENSOR handstamp applied on arrival. 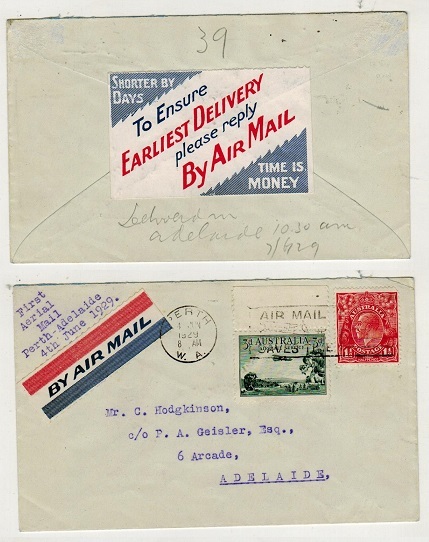 AUSTRALIA - 1934 6d 'OS' + 6d 'air' adhesives on registered first flight cover to Canada. 1934 (AP.6.) 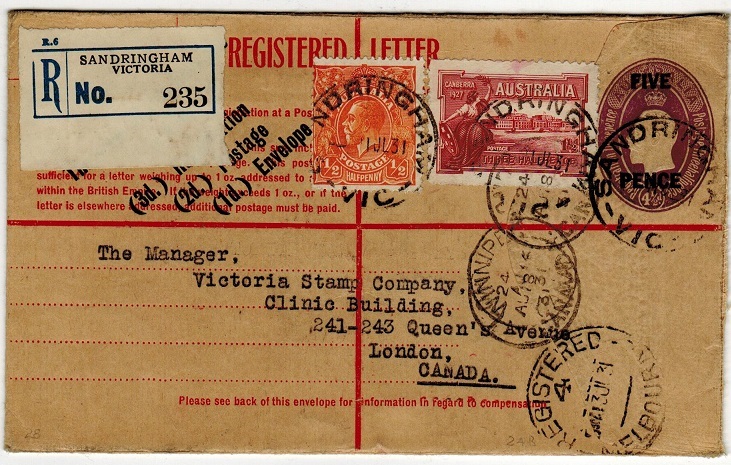 registered first flight cover addressed to Canada 'Per VH-UXX Faith in Australia' bearing the 6d 'Kingsford Smith' adhesive (SG 123) tied in combination with the 6d sepia 'Air Mail Service' adhesive overprinted 'OS' in black (SG 139) by COLLINS STREET/MELBOURNE cds. Cacheted in violet. The use of this 'OS' stamp (sold to the public) is tricky on cover. AUSTRALIA - 1916 2 1/2d 'roo' rate PASSED censor cover to USA used at FAIRFIELD/VIC. 1916 (JE.19.) 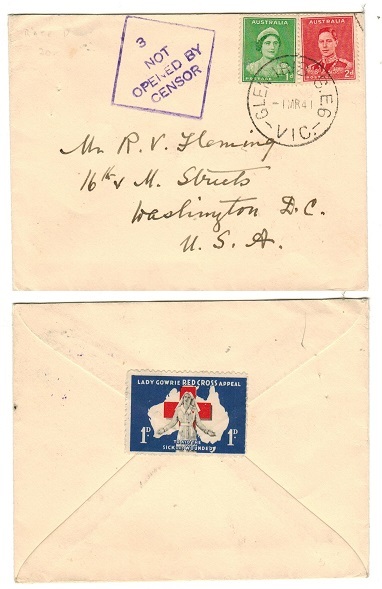 cover addressed to USA bearing 2 1/2d 'roo' tied by neat FAIRFIELD/VIC cds and struck at left by violet PASSED handstamp. AUSTRALIA - 1942 2 1/2d on 2d surcharged local cover used at PARLIAMENT HOUSE. 1942 (JA.22.) local cover bearing 2 1/2d on 2d surcharge adhesive (SG 200) tied by the scarcer PARLIAMENT HOUSE/NSW cds. 1942 (FE.26.) cover addressed to USA bearing 1/2d orange tied alongside 'QV' NSW 3d green overprinted 'OS' tied by OLD GRACEVILLE cds and with red on white OPENED BY CENSOR/1 label at left tied by violet 1/PASSED/BY/CENSOR/23 h/s. The label ties an YOUR WAR JOB/COLLECT ALUMINIUM/POTS AND PANS/FOR PLANES label with an additional label on the reverse flap. AUSTRALIA - 1944 'UNIT POSTAL STATION N/32A' use of FORMULA letter card to USA. 1944 (MAY.2.) 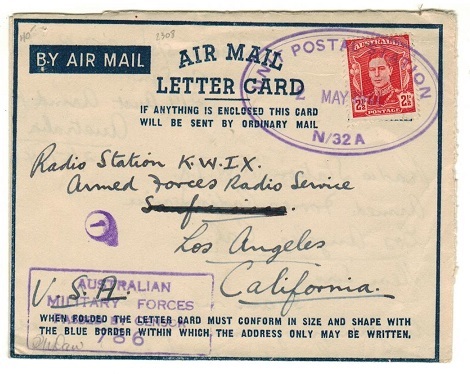 use of blue on cream FORMULA air mail letter card addressed to USA bearing 2 1/2d adhesive tied by large oval UNIT POSTAL STATION/N/32a cancel used by troops stationed in Queensland and with violet boxed AUSTRALIAN/MILITARY FORCES/PASSED BY CENSOR/ 786 h/s at lower left. AUSTRALIA (B.C.O.F.) 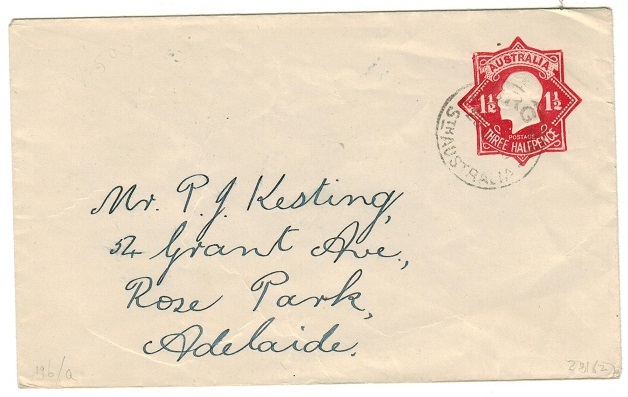 - 1946 first day cover used at No.8 AUST BASE P.O./C. 1946 (OC.11.) 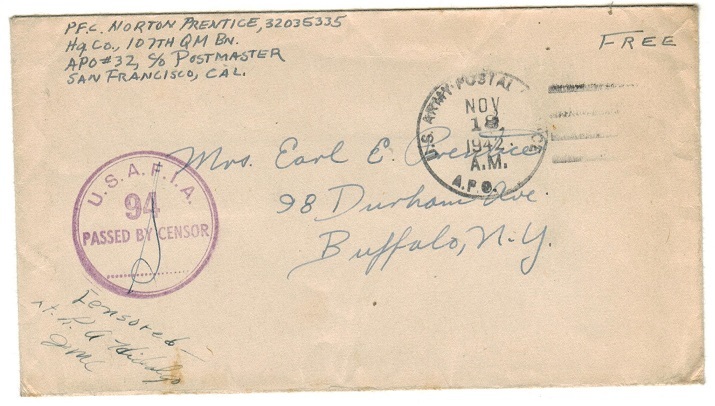 cover addressed to the 4th Base Army P.O. 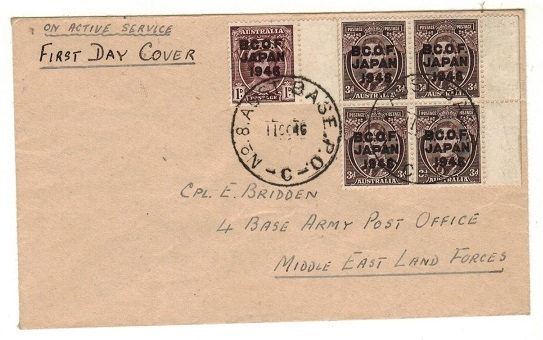 at Middle East Land Forces marked 'On Active Service' and bearing 1d brown-purple (SG J2) and a fine block of four of the 3d purple-brown adhesive (SG J3) each overprinted B.C.O.F./JAPAN/1946 and cancelled by s/r No.8 AUST BASE P.O. - C cancels used by troops in the R.N.Barracks at Kure, Japan. 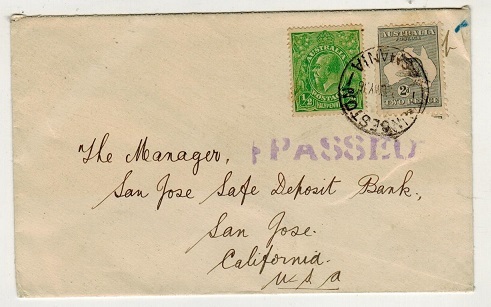 The cover is marked 'First Day Of Issue' and is rare as it is in fact struck the day before issue. AUSTRALIA - 1930 stampless 'PAID AT RENMARK' cover to USA. 1930 (APR.9.) 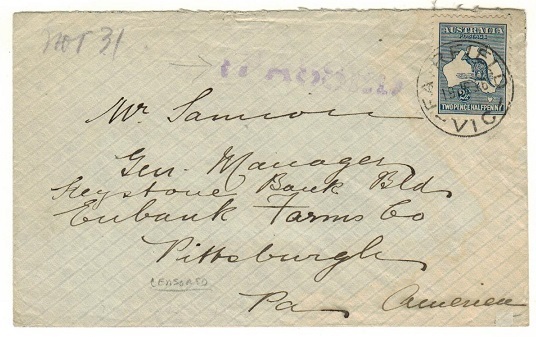 stampless commercial cover addressed to USA with scarce red INSUFFICIENTLY PREPAID MATTER b/s (reverse lightly toned) but clearly cancelled on front by scarce PAID AT RENMARK/S.A. The postage being pre-paid in cash at the Post Office. 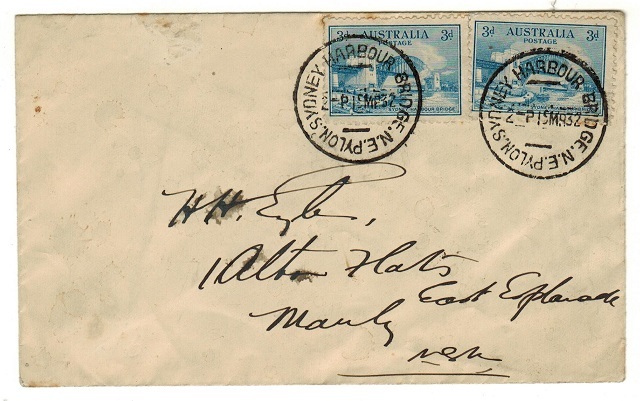 AUSTRALIA - 1936 'PAID AT HOBART' unclaimed and 'DEAD LETTER/EXAMINED 2' cover to Sydney. 1936 (JE.10.) 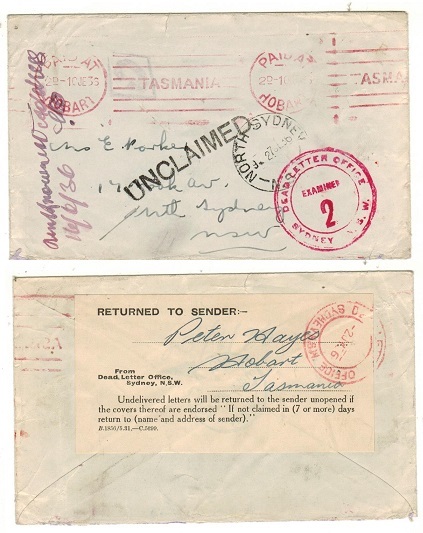 use of stampless cover addressed to Sydney cancelled by scarce red PAID AT/ HOBART-TASMANIA roller strike and with NORTH SYDNEY arrival cds below. The cover was not delivered and struck by black UNCLAIMED h/s and with red d/r DEAD LETTER OFFICE/EXAMINER 2/SYDNEY NSW h/s applied. 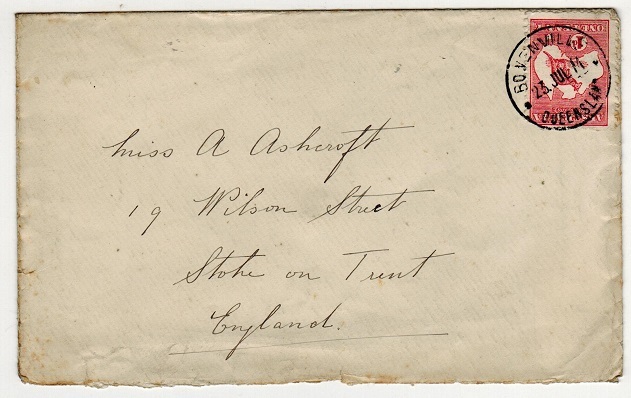 The reverse side shows scarce RETURNED TO SENDER label similarly struck. Nice item. 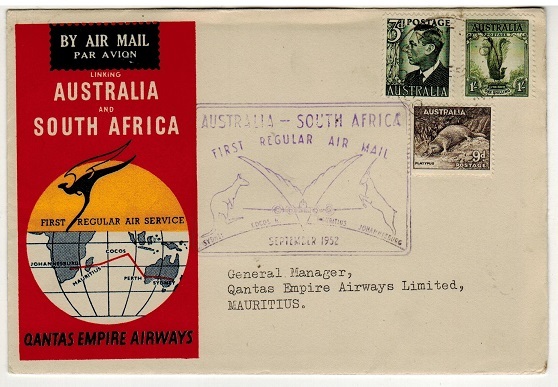 SOUTH AFRICA - 1952 'Qantas Empire Airways' first flight cover to Cocos Island. 1952 (6.IX.) 'Qantas Empire Airways' illustrated first flight cover to Cocos Island bearing 6d and 1/- adhesives tied JOHANNESBURG. RAAF PO/COCOS ISLAND arrival b/s. AUSTRALIA - 1944 1d 'Red Cross' LADY GOWRIE censored cover to Tasmania. 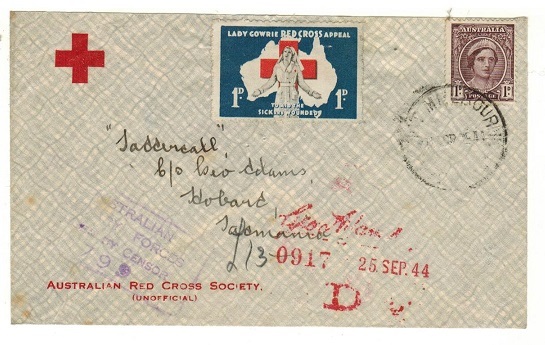 1944 'Red Cross' cover addressed to Tasmania bearing 1d adhesive tied MELBOURNE with red, blue and white 1d/LADY GOWRIE RED CROSS APPEAL label at left and struck by violet AUSTRALIA/MILITARY FORCES/PASSED BY CENSOR/799 h/s applied. AUSTRALIA - 1933 3d ultramarine U/M gutter pair overprinted 'O.S.' SG 0131. 1933 3d ultramarine (die II) adhesive in a fine unmounted mint gutter pair (minute trace of tone spot on margin) each overprinted 'O.S.' in black. A scarce format. SG 0131. Australia - 1932 2D GOLDEN SCARLET U/M gutter pair overprinted 'O.S.' SG 0130. 1932 2d golden scarlet (die III) in a fine unmounted mint gutter marginal pair (mounted in gutter) each overprinted 'O.S.' in black. A scarce format. SG O130. 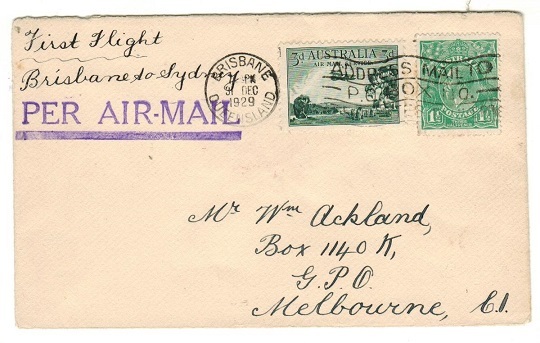 AUSTRALIA - 1929 first flight cover to Adelaide with EARLIEST DELIVERY label on reverse. 1929 (JUN.4.) 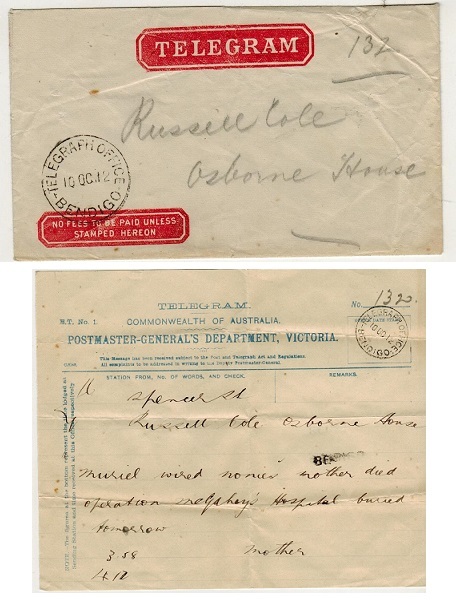 first flight cover addressed to Adelaide bearing 1 1/2d 'head' adhesive tied with 3d 'air' issue by PERTH/W.A. AIRMAIL SAVES TIME slogan strike with red,white and blue BY AIR MAIL label at left and with the reverse having the SHORTER BY DAYS/TO ENSURE/EARLIEST DELIVERT/PLEASE REPLY/BY AIR MAIL/TIME IS MONEY label . AUSTRALIA - 1919 'A.I.F.' 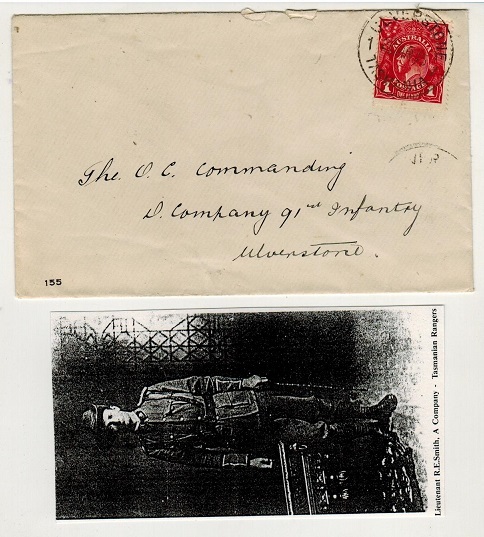 stampless postcard use to UK with MILITARY SECRETARY frank. 1919 (AP.26.) 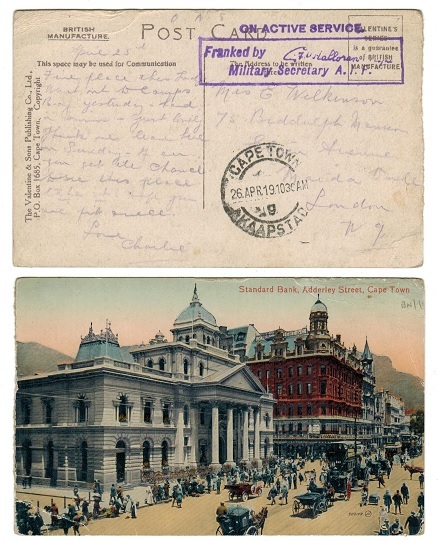 stampless use of picture postcard from South Africa to UK depicting 'Standard bank, Adderley Street, Cape Town' and cancelled by CAPE TOWN/KAAPSTAD cds. Struck at top by fine violet ON ACTIVE SERVICE h/s above boxed FRANKED BY/MILITARY SECRETARY A.I.F. h/s. A nice Australian Imperial Force marking. AUSTRALIA - 1912 TELEGRAM and telegram form used at BENDIGO. 1912 (OC.12.) 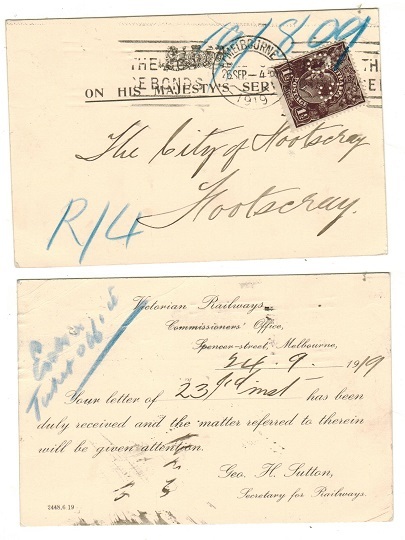 - (E.T.No.1) TELEGRAM/COMMONWEALTH OF AUSTRALIA/POSTMASTER GENERAL DEPARTMENT VICTORIA telegram form cancelled TELEGRAPH OFFICE/BENDIGO and complete with TELEGRAM envelope similarly cancelled. (2 items). AUSTRALIA - 1946 7d blue air letter used on the Qantas first flight to UK. Pilot signed. 1946 (AP.9.) 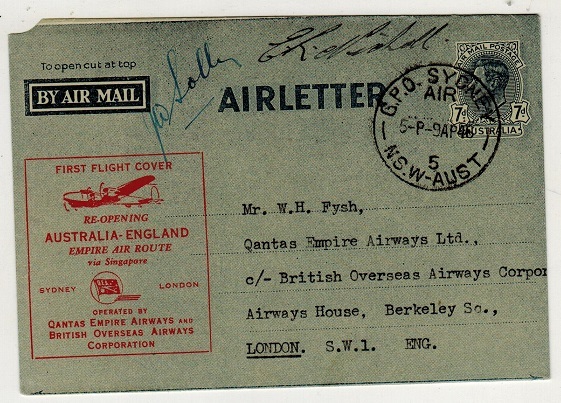 first flight use of 7d blue air letter addressed to UK (no message) cancelled GPO/SYDNEY/AIR and with red FIRST FLIGHT COVER/RE-OPENING/AUSTRALIA-ENGLAND cachet applied at left. Pilot signed. Eustis 1038a. 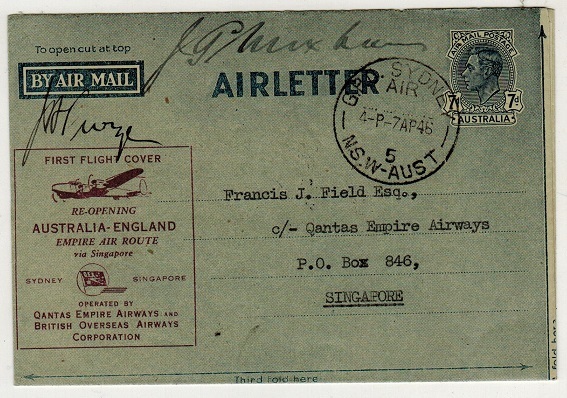 AUSTRALIA - 1946 7d blue air letter used on the Qantas first flight to Singapore. Pilot signed. 1946 (AP.7.) 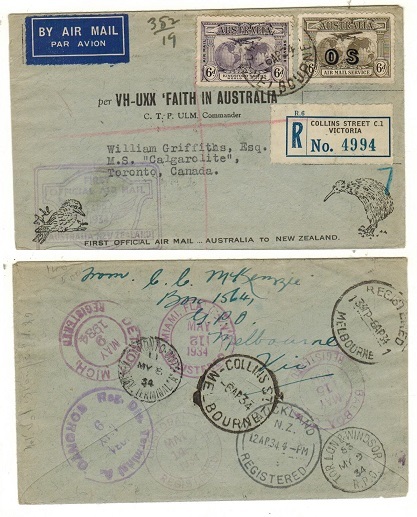 first flight use of 7d blue air letter addressed to UK (no message) cancelled GPO/SYDNEY/AIR and with purple FIRST FLIGHT COVER/RE-OPENING/AUSTRALIA-ENGLAND cachet applied at left. Pilot signed. Eustis 1036a. Australia - 1945 7d blue air letter used on Qantas first flight to UK. 1945 (JN.1.) 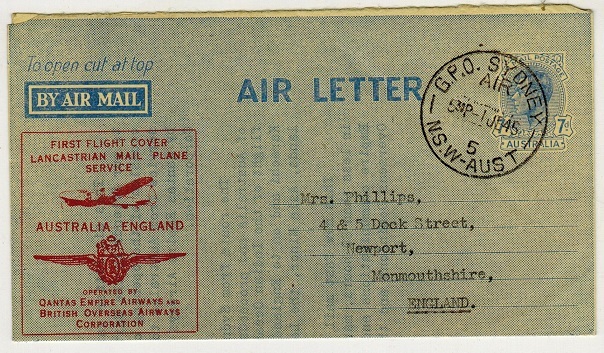 first flight use of 7d blue air letter addressed to UK (genuine use) cancelled GPO/SYDNEY/AIR and with red FIRST FLIGHT COVER/LANCASTRIAN MAIL PLANE/SERVICE cachet applied at left. Eustis 1007b. AUSTRALIA - 1917 underpaid 'PASSED BY CENSOR' taxed cover to USA used at ADELAIDE. 1917 (JUL.26.) 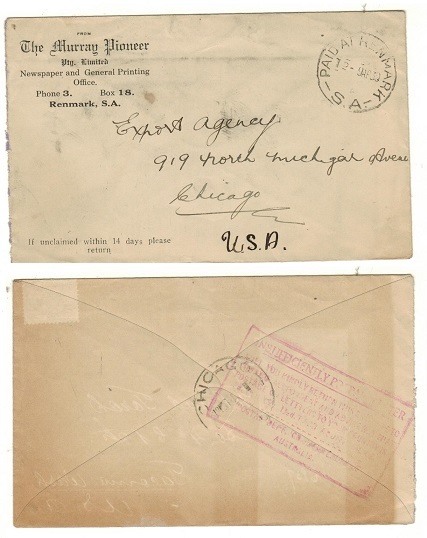 cover addressed to USA (ex. flap) bearing 1d 'head' adhesive tied by ADELAIDE roller bar cancellation. The cover being under paid having circular 'T/30CTS' handstamp applied at left in black and with scarce magenta oval PASSED BY/4th M.D./CENSOR handstamp applied. A scarce civil censorship handstamp. AUSTRALIA - 1916 2 1/2d rate 'PASSED' censor cover to USA used at LAUNCESTON/TASMANIA. 1916 (MY.26.) 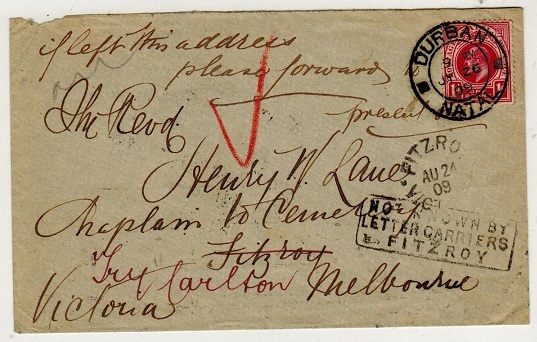 cover addressed to USA bearing 1/2d 'head' with 2d grey 'roo' (corner damage) cancelled by LAUNCESTON/TASMANIA cds with scarce violet PASSED censor h/s below. AUSTRALIA - 1932 3d 'bridge' pair on local cover used at N.E.PYLON/SYDNEY HARBOUR BRIDGE. 1932 (MR.15.) 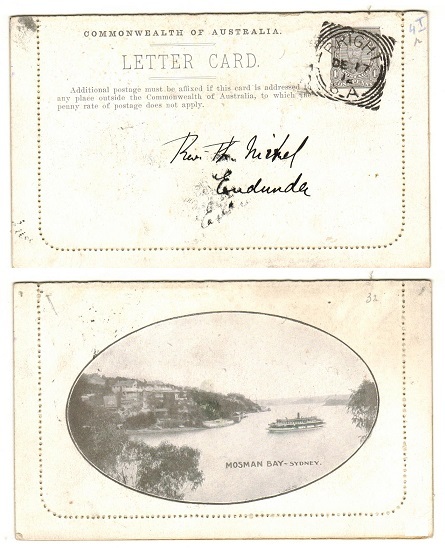 cover addressed locally to Manly bearing 3d 'bridge' adhesive pair (SG 142) tied by scarcer SYDNEY HARBOUR BRIDGE/N.E.PYLON cancels on the second day of issue. AUSTRALIA - 1931 2d rate 'A.R.' cover used locally from ADELAIDE. 1931 (DEC.2.) 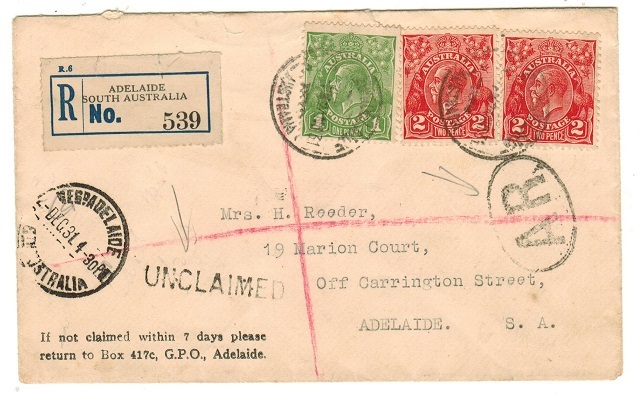 registered cover addressed locally bearing 1d green and 2d scarlet 'head' adhesives tied ADELAIDE with oval 'A.R.' (Avis Reception) h/s applied at left and straight line UNCLAIMED mark applied in black. AUSTRALIA - 1919 1 1/2d 'OS' perf stamp on OHMS local postcard used at MELBOURNE. 1919 (SEP.4.) 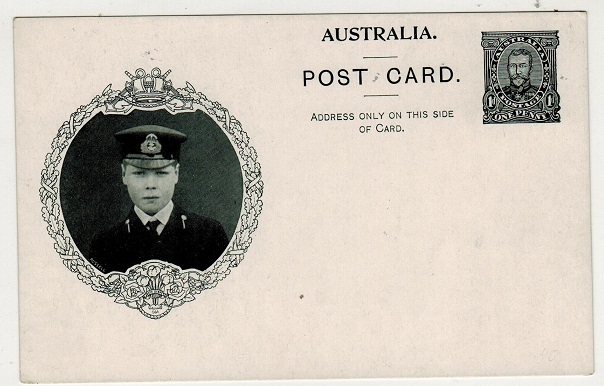 use of official ON HIS MAJESTYS SERVICE cream postcard addressed locally and bearing 1 1/2d black-brown 'head' adhesive perforated 'OS' and tied by MELBOURNE (Bonds) slogan roller strike. The reverse is pre-printed for use by the Victorian Railways. AUSTRALIA - 1929 first flight cover to Melbourne on the 'ANA' Brisbane to Sydney flight. 1929 (DEC.31.) first flight cover addressed to Melbourne taken on the Brisbane to Sydney flight by Australian National Airways bearing 1 1/2d green 'head' adhesive and 3d 'air mail' adhesive tied BRISBANE. AUSTRALIA - 1946 5/10d blue 'Myers Emporium Ltd' food label used. H&G 2. 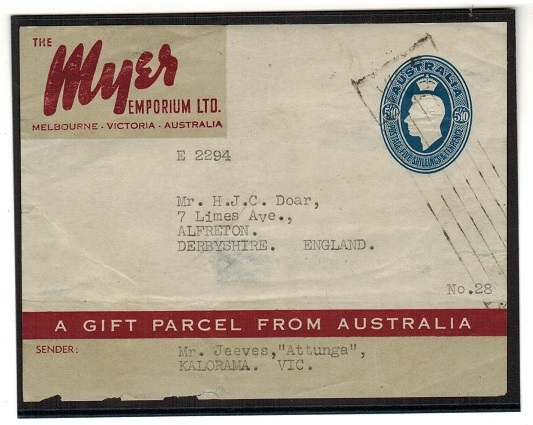 1946 5/10d blue 'Myers Emporium Ltd' gift parcel label addressed to UK cancelled by the usual barred VICTORIA cancellator. A scarce parcel post private printed label. H&G 2. 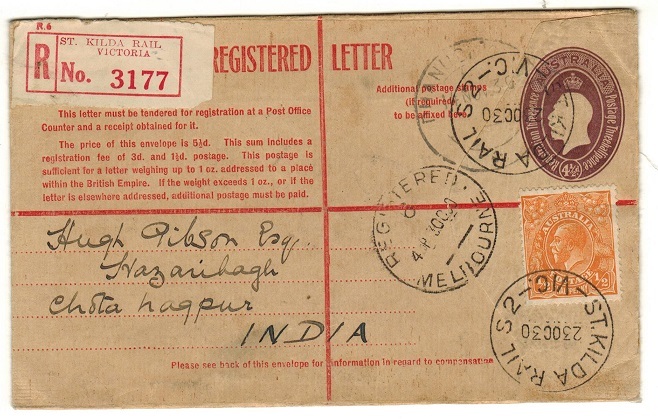 AUSTRALIA - 1944 use of 'POSTAGE 1d PAID' air letter locally by Imperal Forces. H&G IFG3. 1944 (JAN.1.) 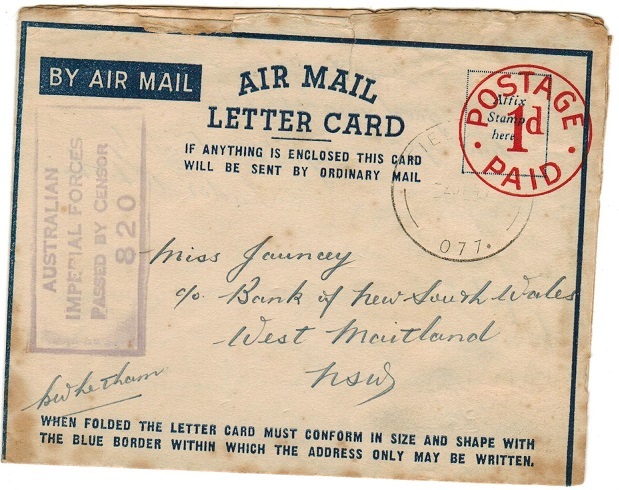 use of blue on cream FORMULA air letter addressed to West Maitland in NSW pre stamped POSTAGE/1d/PAID in red and cancelled by FIELD P.O./077 cds with violet boxed AUSTRALIAN/IMPERIAL FORCES/PASSED BY CENSOR/820 h/s applied at left. Some light tone spots around the edges. A scarce use of this stationery. H&G IFG3. 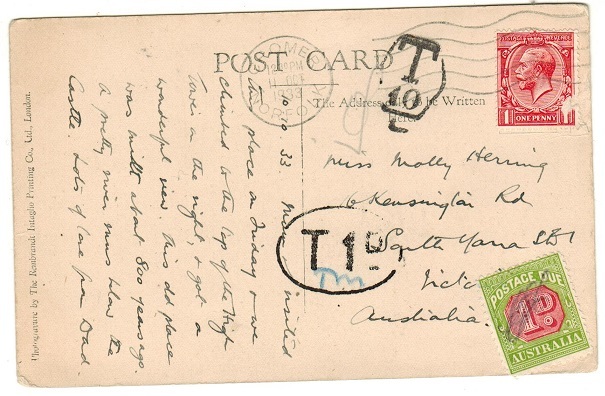 AUSTRALIA - 1909 inward cover from Natal with 'NOT KNOWN/LETTER CARRIERS/FITZROY' h/s. 1909 (AU.24.) inward cover from Natal struck on arrival FITZROY/VICTORIA but the cover was not delievered and bears a black boxed NOT KNOWN BY/LETTER CARRIERS/FITZROY h/s. AUSTRALIA - 1931-36 10/-, £1 and £2 'Roo' trio mint hand stamped SPECIMEN. SG 136-38s. 1931-36 10/- grey and pink, £1 grey and £2 black and rose each in fine mint condition and hand stamped SPECIMEN in black. SG 136-38s. AUSTRALIA - 1913 1d grey illustrated letter card used at HAYMARKET. H&G 5. 1913 1d grey on grey postal stationery letter card addressed to UK depicting illustration of 'Botanic Gardens' on reverse side and cancelled by HAYMARKET P.O. roller strike dated FE.5.13. H&G 5. 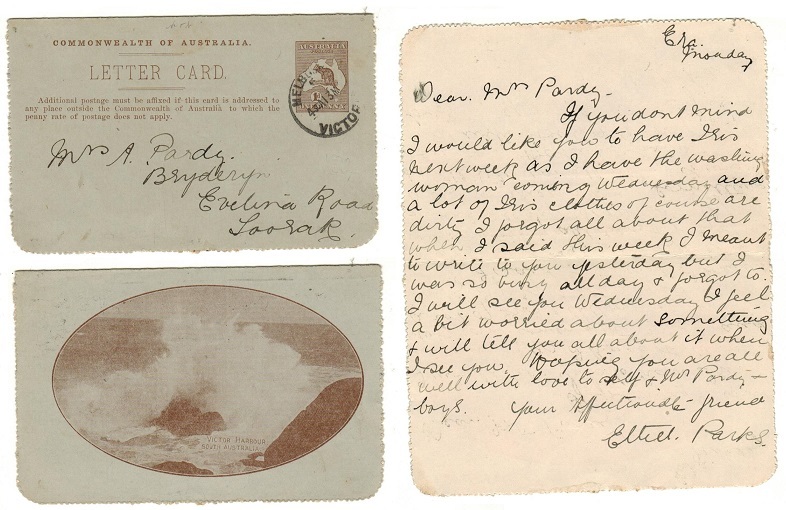 AUSTRALIA - 1913 1d brown 'roo' illustrated letter card used at MELBOURNE. H&G 5. 1913 1d brown on grey postal stationery letter card addressed to UK depicting illustration of 'Victor Harbour' on reverse side and cancelled by MELBOURNNE/VICTORIA cds. H&G 5. 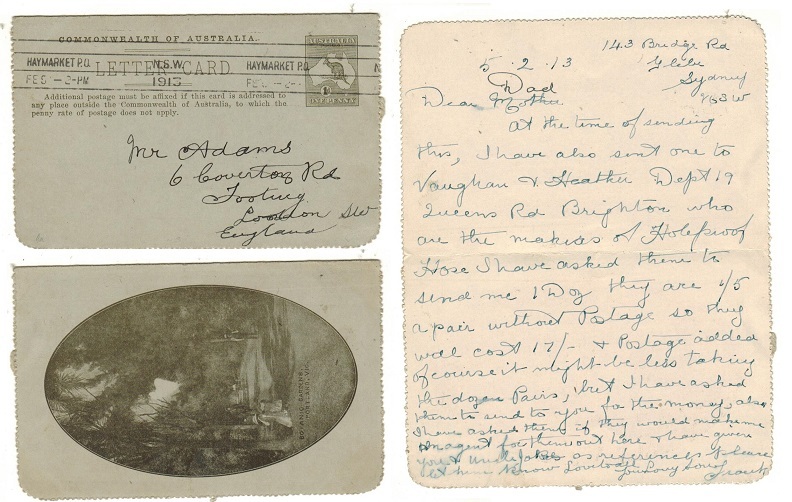 AUSTRALIA - 1911 1d red illustrated letter card cto'd BRINKWORTH. H&G 3. 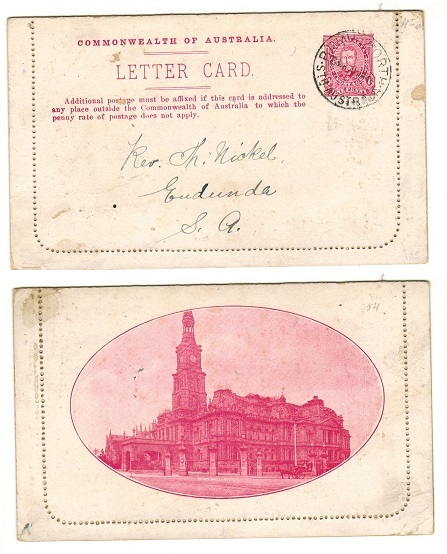 1911 1d red on white illustrated postal stationery letter card addressed locally (no message and still sealed) depicting 'Public Buildings, Bendigo' and cancelled BRINKWORTH/Sth AUSTRALIA and dated 20.OC.12. H&G 3. AUSTRALIA - 1911 1d green illustrated letter card cto'd BRIGHT/S.A. H&G 3. 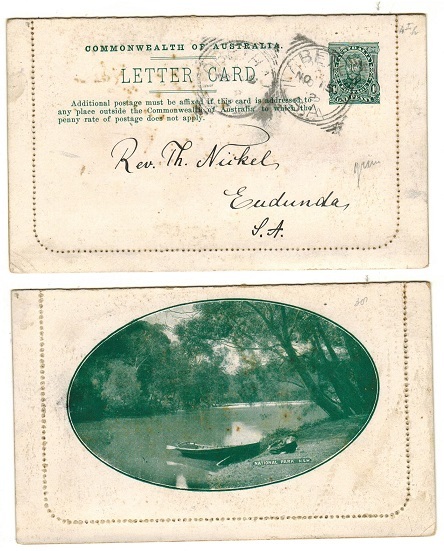 1911 1d green on white illustrated postal stationery letter card addressed locally (no message and still sealed) depicting 'National Park NSW' and cancelled BRIGHT/S.A. and dated NO.15.12. H&G 3. AUSTRALIA - 1911 1d brown illustrated letter card cto'd BRIGHT/S.A. H&G 3. 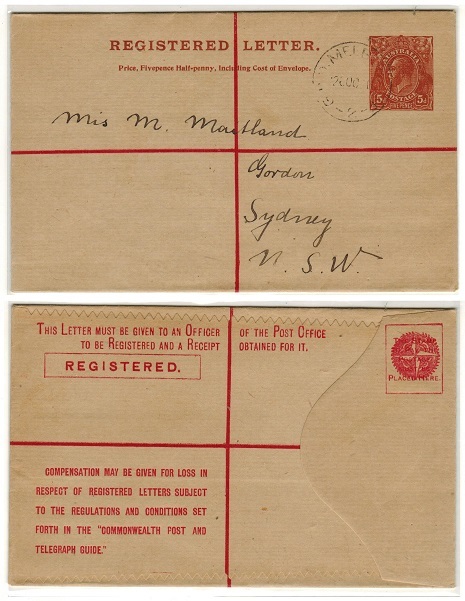 1911 1d brown on white illustrated postal stationery letter card addressed locally (no message and still sealed) depicting 'Mosman Bay-Sydney' and cancelled BRIGHT/S.A. cds dated DE.17.12. H&G 3. 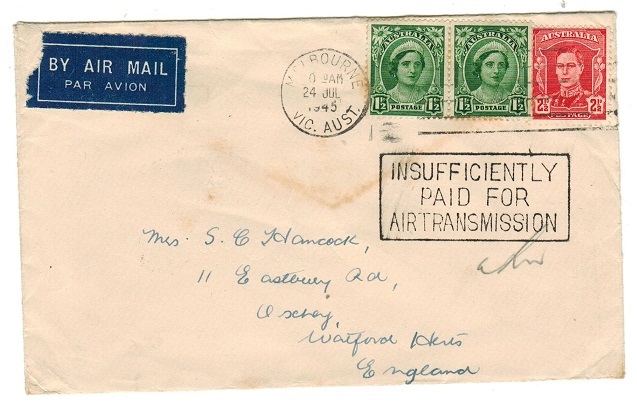 AUSTRALIA - 1941 'POW' cover to UK cancelled by DEFENCE FORCES MAIL/NO POSTAGE REQUIRED cancel. 1941 (MAR.10.) 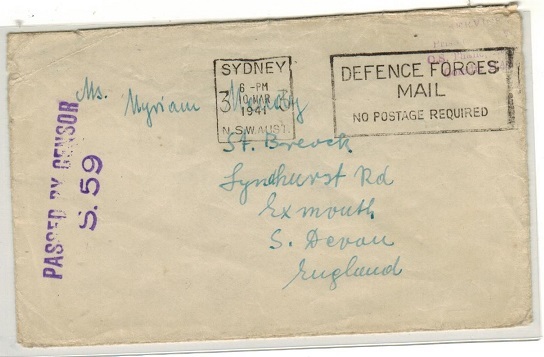 stampless cover addressed to UK struck by light magenta SERVICE/PRISONER OF WAR/O.S.THANE handstamp at top right corner over stamped by boxed DEFENCE FORCES/MAIL/ NO POSTAGE REQUIRED cancel of SYDNEY and with violet PASSED BY CENSOR/S.59 strike at left. AUSTRALIA (Antarctic Territory) - Range of four different 'base' covers. 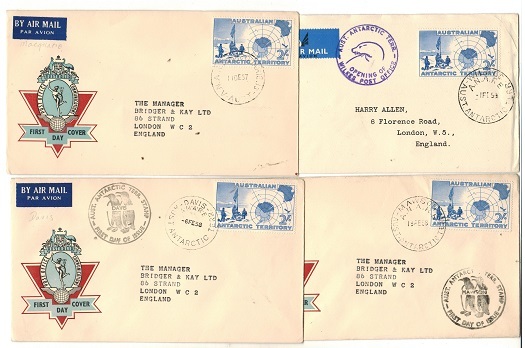 1957-58 range of four covers to UK bearing the 2/- 'Expedition' adhesive (SG 1) used at different bases inc Wilkes, Davis,Macquarie and Mawson each cacheted accordingly. Four covers. 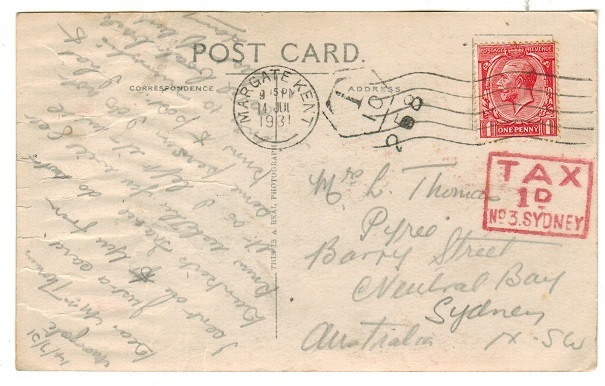 AUSTRALIA - 1914 cover to UK with 1d 'roo' 'PERFORATED OS' used at MELBOURNE. 1914 (OCT.29.) Government crested envelope addressed to UK complete with the original contents bearing 1d 'roo' adhesive perforated 'O.S.' (small type) and tied by MELBOURNE roller strike. AUSTRALIA - 1930 5d brown RPSE used locally uprated at MARKET SQUARE GEELONG. H&G 30. 1930 5d brown on buff registered postal stationery envelope addressed to Brisbane cancelled by MARKET SQUARE GEELONG cds dated 23.NOV.31. H&G 30. AUSTRALIA - 1930 5d on 4 1/2d violer RPSE to Canada uprated at SANDRINGHAM. H&G 28. 1930 FIVE PENCE on 4 1/2d violet on buff registered postal stationery envelope (size G) revalued at left in black THE PRICE OF THIS ENVELOPE/is 6d/(3d) REGISTRATION/(2d) POSTAGE/(1d) ENVELOPE. Addressed to Canada and bearing additional 1/2d 'head' adhesive and 1 1/2d 'Canberra' adhesives tied SANDRINGHAM/VIC and dated 1.JY.31. B&W RE24. H&G 28. AUSTRALIA - 1928 4 1/2d violet RPSE to India uprated at ST.KILDA. H&G 26. 1928 4 1/2d violet on buff registered postal stationery envelope (size G) with red text addressed to India and bearing additional 1/2d orange 'head' adhesive tied by ST.KILDA RAIL S2/VIC cds dated 23.OC.30. A scarce Railway Station PO usage. H&G 26. AUSTRALIA - 1928 4 1/2d violet RPSE to New Zealand uprated at GUILDFORD. H&G 26. 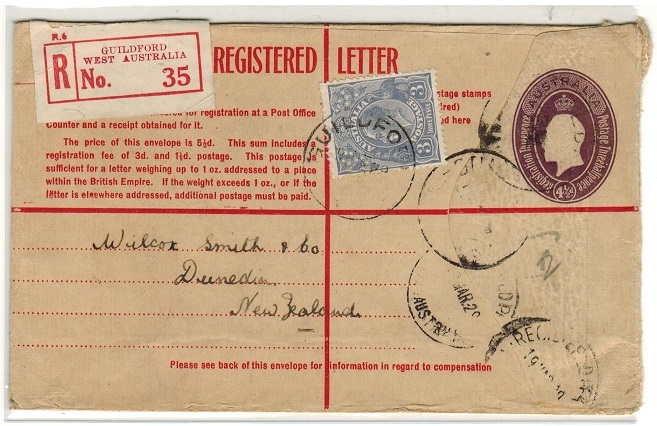 1928 4 1/2d violet on cream registered postal stationery envelope addressed to New Zealand and bearing additional 3d 'head' adhesive tied by GUILDFORD cds. H&G 26. 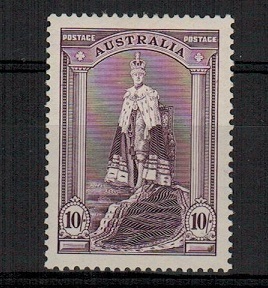 AUSTRALIA - 1925 4 1/2d violet RPSE to UK used. H&G 25. 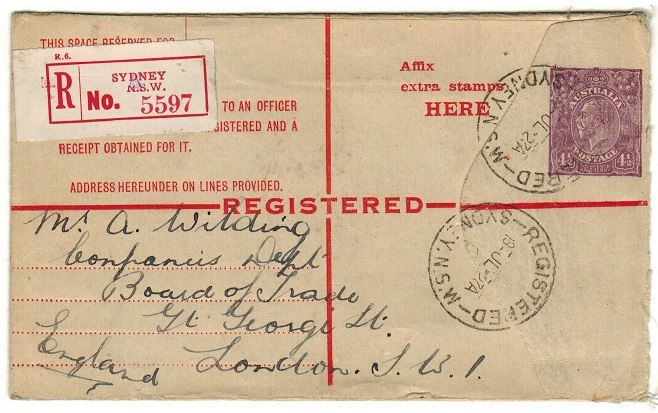 1925 4 1/2d violet on buff registered stationery envelope addressed to UK cancelled REGISTERED SYDNEY N.S.W. & dated 18.JL.27. H&G 25. AUSTRALIA - 1925 4 1/2d violet on buff RPSE unused. H&G 25. 1925 4 1/2d violet on buff registered postal stationery envelope (red text) in fine unused condition. H&G 25. AUSTRALIA - 1924 4 1/2d violet on buff RPSE to UK used at BROKEN HILL. H&G 24. 1924 4 1/2d violet on buff registered postal stationery envelope (violet text) addressed to UK cancelled by BROKEN HILL/NSW cds dated 7.JL.24. H&G 24. AUSTRALIA - 1924 4 1/2d violet on buff RPSE unused. H&G 24. 1924 4 1/2d violet on buff registered postal stationery envelope (violet text) in fine unused condition. H&G 24. AUSTRALIA - 1922 5d brown RPSE uprated to Sydney at DAPTO/NSW. H&G 16. 1922 5d brown on buff registered postal stationery envelope showing the address panel on the left side addressed to Sydney and bearing additional 2d 'head' adhesive tied by DAPTO/NSW cds dated 10.MY.23. (Dotted address lines at left). H&G 16. AUSTRALIA - 1922 5d brown RPSE unused (BW RE12). H&G 15a. 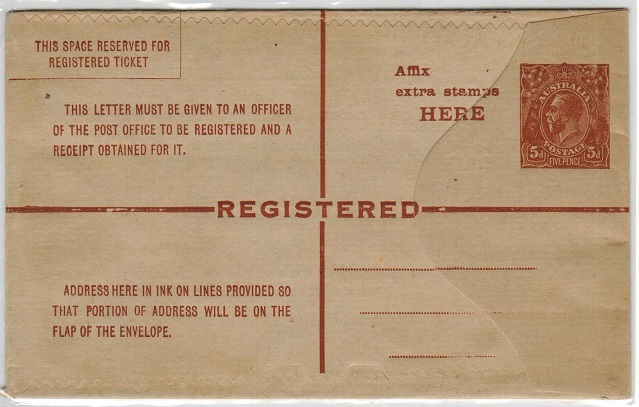 1922 5d brown on buff registered postal stationery envelope showing address panel on the left in fine unused condition. (BW type RE12). A scarce envelope. H&G 15a. AUSTRALIA - 1920 5d brown RPSE used at GPO/MELBOURNE. H&G 9. 1920 5d brown on buff registered postal stationery envelope (horizontal laid paper) addressed to Sydney and cancelled by G.P.O.MELBOURNE cds dated 2.OC.20. H&G 9. AUSTRALIA - 1923 4 1/2d on 5d brown RPSE unused. H&G 19. 1923 FOURPENCE/HALFPENNY surcharge in black on 5d brown on buff registered postal stationery envelope in fine unused condition. H&G 19. AUSTRALIA - 1923 4 1/2d on 5d brown RPSE used at NEWCASTLE/NSW. H&G 19. 1923 FOURPENCE/HALFPENNY surcharge in black on 5d brown on buff registered postal stationery envelope (size G) addressed to Sydney and cancelled by NEWCASTLE/NSW cds. H&G 19. AUSTRALIA - 1960 issued 1/3d 'Reply Coupon' at PUBLIC OFFICE/VIC. 1960 issued 1/3d blue and yellow on white (Formule C.22.) 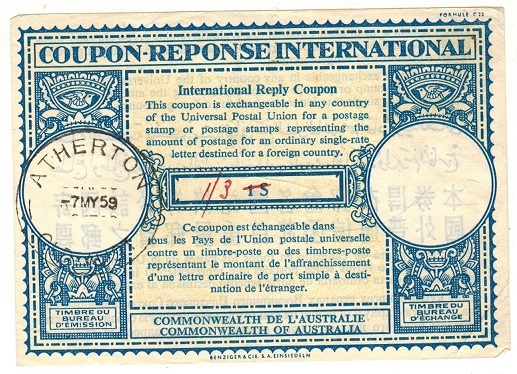 'International Reply Coupon-Commonwealth of Australia' cancelled PUBLIC OFFICES/VIC.AUST cds (issue office) dated 6.JA.60. AUSTRALIA - 1959 issued 1/- 'Reply Coupon' at ATHERTON/QLD. 1959 issued 1/- blue and yellow on white (Formule C.22.) 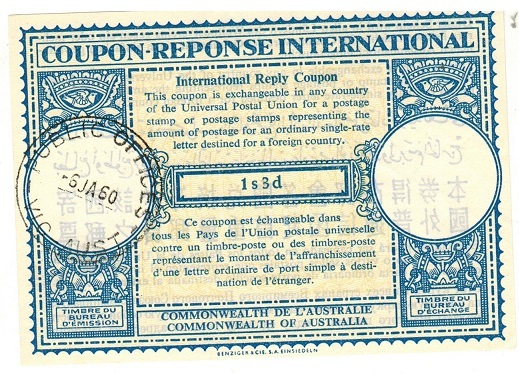 'International Reply Coupon-Commonwealth of Australia' with the '1/-' manuscriptly cancelled by red pen and '1/3d' inserted. Cancelled ATHERTON/ QLD.AUST (issue office) and dated 7.MY.59. 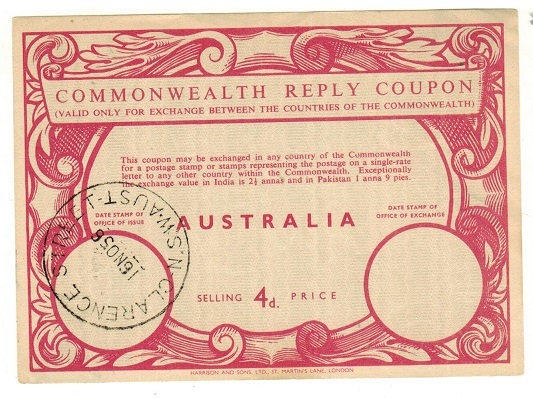 AUSTRALIA - 1956 issued 4d 'Commonwealth Reply Coupon' at CLARENCE STREET/NSW. 1956 issued 4d red on cream 'Commonwealth Reply Coupon' cancelled CLARENCE STREET/ NSW.AUST (issue office) and dated 16.NO.56. 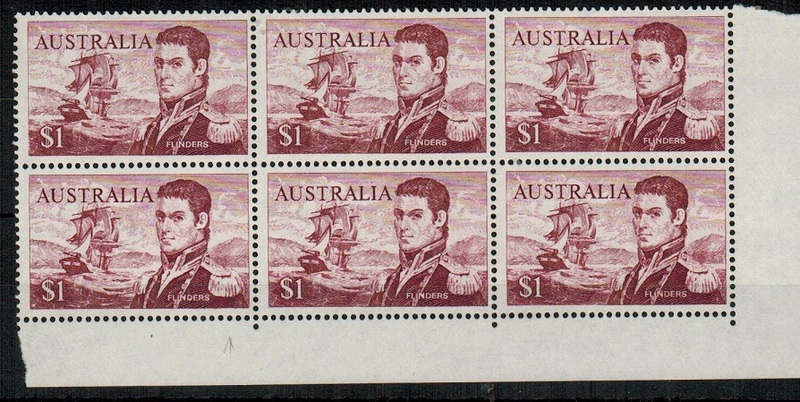 AUSTRALIA - 1966 $1 'Flinders' U/M block of 4 with RECUT LINES/CRACKED PLATE variety. SG 407b. 1966 $1 brown-purple 'Flinders' adhesive in a fine unmounted mint corner marginal block of four showing the RECUT LINES/CRACKED PLATE variety from Row 10/1. SG 407b. 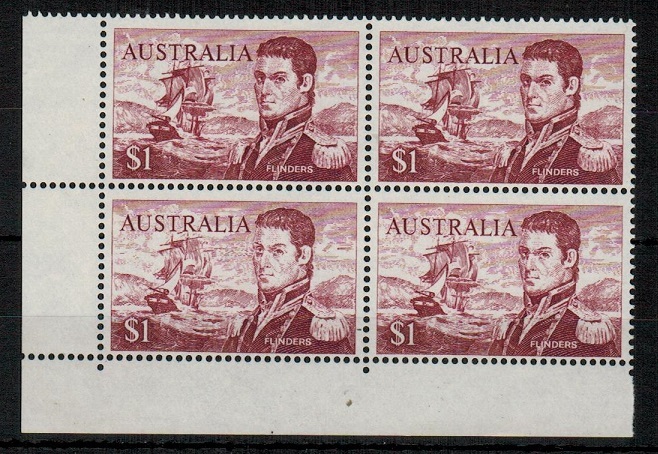 AUSTRALIA - 1966 $1 'Flinders' U/M block of six with MISSING SHADING variety. SG 401. 1966 $1 brown-purple 'Flinders' adhesive in a fine unmounted mint corner marginal block of six showing MISSING SHADING TO RIGHT SHOULDER by Flinders inscription. SG 401. AUSTRALIA (Antarctic Territories) - 1957/8 range of 4 2/- rate covers from different bases. 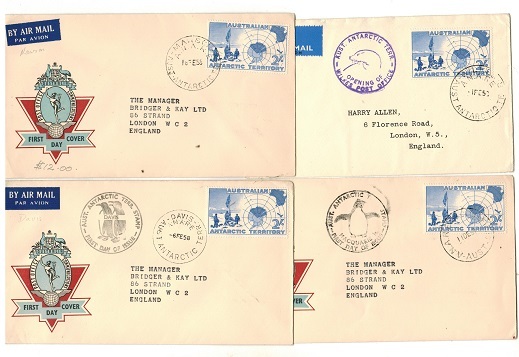 1957-58 range of four covers to UK bearing the 2/- 'Expedition' adhesive (SG 1) used at different bases inc Wilkes, Davis, Macquarie and Mawson each cacheted accordingly. Four covers. 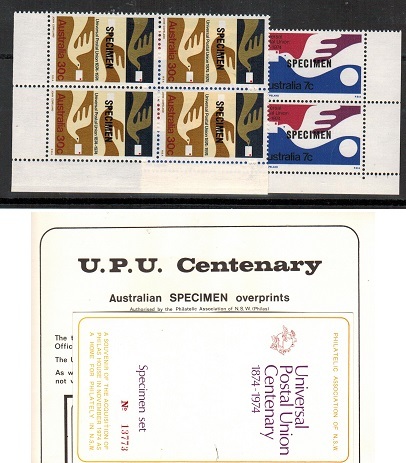 AUSTRALIA - 1974 'UPU' U/M blocks of four SPECIMEN. SG 576-77. 1974 UPU pair (SG 576+577) in fine unmounted mint marginal blocks of four each struck SPECIMEN in black and with 'PHILAS HOUSE APPEAL' red back stamp on gum. These were prepared for special UPU Centenary 'A.P.O.' cards as souvenirs and as they were affixed only as singles, multiples of this stamp are scarce. Complete with unused card and advertisement flyer. AUSTRALIA - 1952 'Qantas Empire Airways' illustrated first flight cover to Mauritius. 1952 'Qantas Empire Airways' illustrated first flight cover to Mauritius. 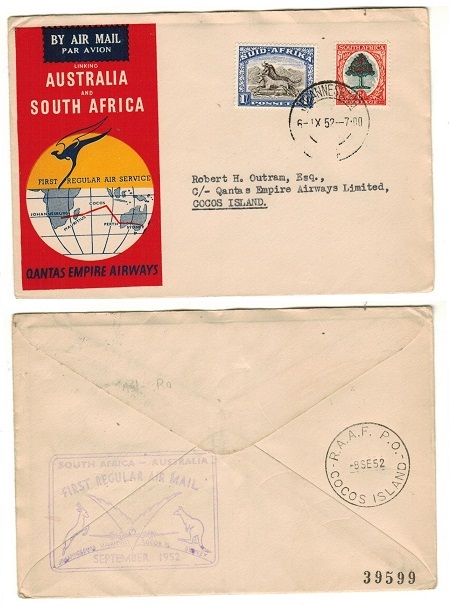 AUSTRALIA - 1952 'Qantas Empire Airways' first flight cover to South Africa and return. 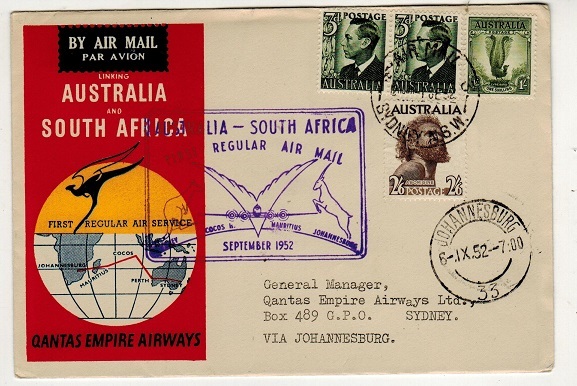 1952 'Qantas Empire Airways' illustrated first flight cover to South Africa and return. AUSTRALIA - 1969 'B.P. Air Race' flight cover. 1965 'B.P. 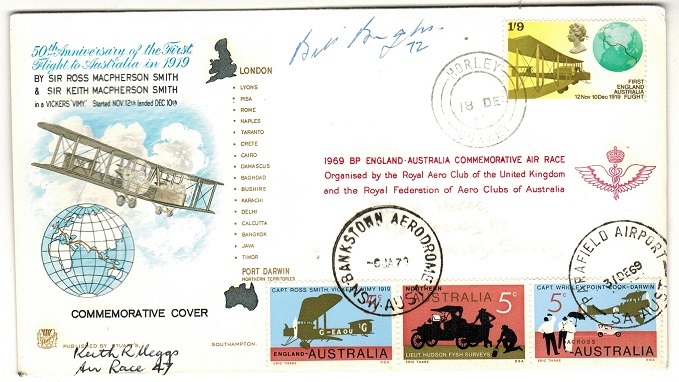 Air Race' cover from UK to Australia and return flown by Keith R Meggs and signed by him and the actual winner of the race Bill Bright. HORLEY outward cds dated 18.DE.69 with Australian adhesives added and tied by BANKSTOWN AERODROME dated 6.JA.70 on its return. 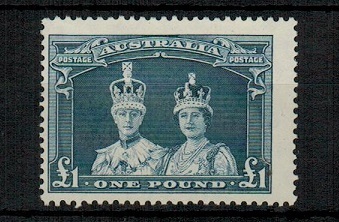 AUSTRALIA - 1948 £1 bluish slate in fine lightly mounted mint condition. SG 178a. 1948 £1 bluish slate 'robe' adhesive in fine lightly mounted mint condition printed on thin rough ordinary paper. SG 178a. AUSTRALIA - 1948 10/- dull purple lightly mounted mint. SG 177a. 1948 10/- dull purple 'robe' adhesive in fine lightly mounted mint condition printed on thin rough ordinary paper. SG 177a. AUSTRALIA - 1931 'HOBART EXHIBITION' local 1d rate cover. 1931 (SEP.8.) cover addressed locally to Hobart bearing 1/2d orange 'head' adhesive pair tied by HOBART/TAS-CONVERSION/LOAN/NOW OPEN slogan strike and struck at lower left by large violet circular ART, ANTIQUE AND HISTORICAL EXHIBITION/HOBART 1931 h/s stating the cover was posted at the exhibition in the original bag that the people of Hobart dispatched their letters in. AUSTRALIA - 1942 'P.O.W.' censored letter sheet to Italy with NO.5 P.W. GROUP MYRTLEFORD h/s. 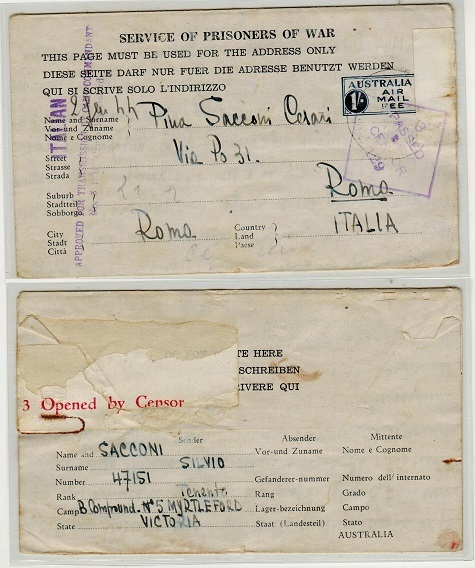 1942 use of 'Prisoner Of War' letter sheet addressed to Italy cancelled by MELBOURNE/VIC cds. Struck on front by violet No.5 P.W.GROUP MYRTLEFORD/APPROVED FOR TRANSMISSION BY CAMP COMMANDANT with ITALIAN and SERVICE OF/PRISONERS OF WAR handstamps at left. Violet boxed PASSED BY/CENSOR/ V147…. strike applied with red on white 3 OPENED BY CENSOR label on reverse side and violet boxed PWI No…NAME…./B COMPOUND/No.5 P.W. GROUP MYRTLEFORD AUSTRALIA strike. AUSTRALIA - 1944 (circa) 1/- blue 'P.O.W.' 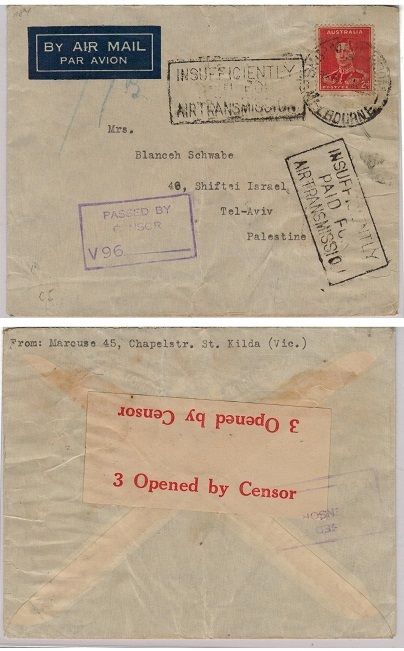 censored letter sheet to Italy. 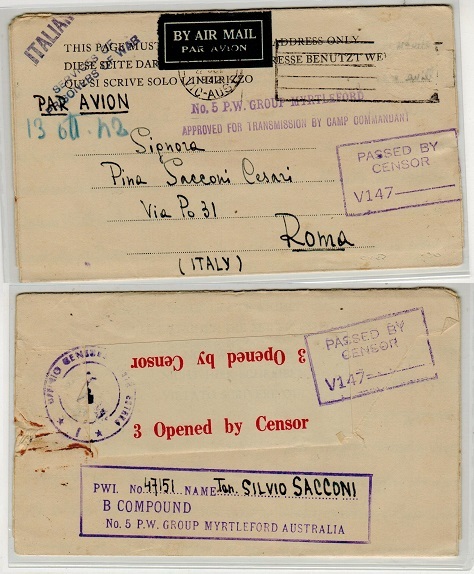 1944 (circa) use of special 1/- blue AUSTRALIA/AIR MAIL FEE 'Prisoner Of War' postal stationery letter sheet addressed to Italy cancelled by P.O.MYRTLEFORD cds with violet 3/PASSED BY CENSOR 129 h/s on front and red on white 3 OPENED BY CENSOR label on reverse. Struck at left by scarcer ITALIAN/APPROVED FOR TRANSMISSION BY CAMP COMMANDANT/No5 P.W. CENSOR MYRTLEFORD. A scarce POW item. AUSTRALIA - 1949 'FLOOD RELIEF' cover from Tibooburra. 1949 (MY.25.) 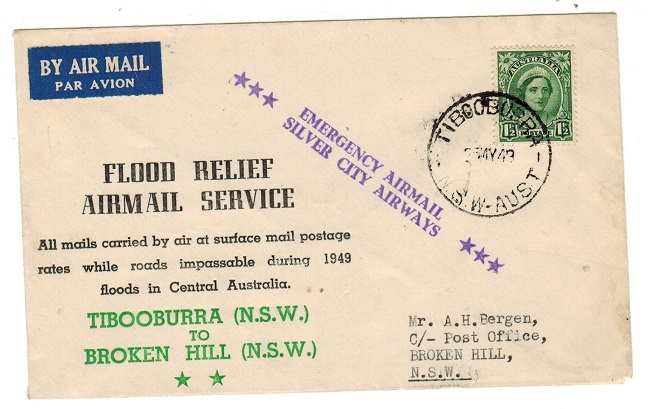 cover addressed locally bearing 1 1/2d adhesive tied by TIBOOBURRA/NSW cds and struck by violet two lined EMERGENCY AIRMAILS/SILVER CITY AIRWAYS on pre-printed FLOOD RELIEF/AIRMAIL SERVICE envelope. 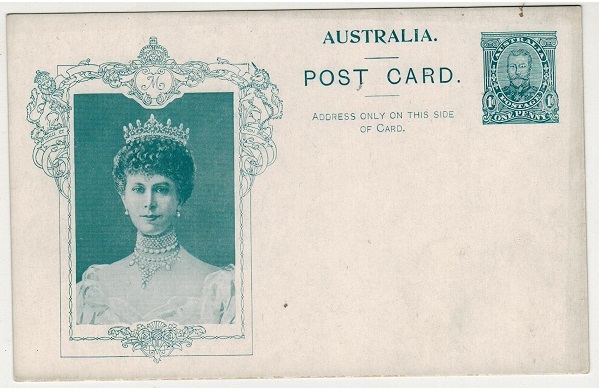 AUSTRALIA - 1911 1d turquoise 'Coronation' PSC unused. H&G 4. 1911 1d turquoise 'Coronation' postal stationery card in fine unused condition with squared box at left depicting Queen Mary. H&G 4. AUSTRALIA - 1911 1d brown 'Coronation' PSC unused. H&G 4. 1911 1d brown 'Coronation' postal stationery card in fine unused condition with small crested oval at left depicting young Prince Of Wales. H&G 4. AUSTRALIA - 1911 1d black 'Coronation' PSC unused. H&G 4. 1911 1d black 'Coronation' postal stationery card in fine unused condition with small crested oval at left depicting young Prince Of Wales. H&G 4. 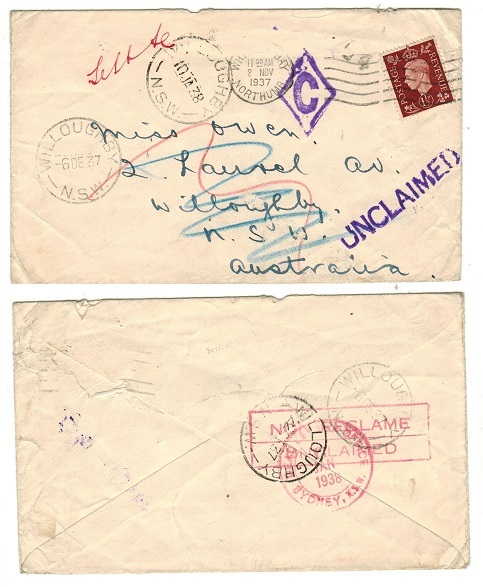 AUSTRALIA - 1937 inward UNCLAIMED cover from UK to NSW. 1937 inward cover from UK with WILLOUGHBY/NSW arrival cds dated 6.DE.37. 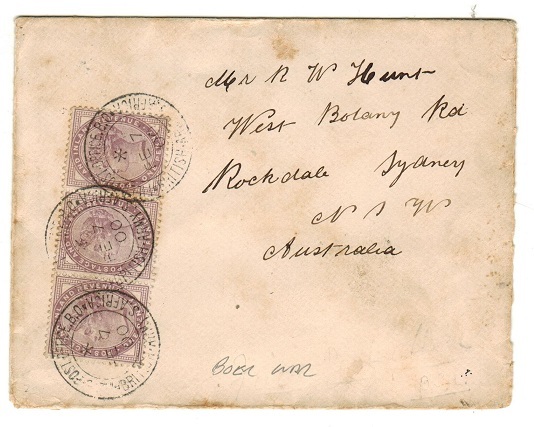 The cover was not delivered and has been struck by violet UNCLAIMED handstamp and has violet diamond 'C' strike applied to front and with red boxed NON RECLAIME/UNCLAIMED b/s and DEAD LETTER OFFICE/SYDNEY strike. 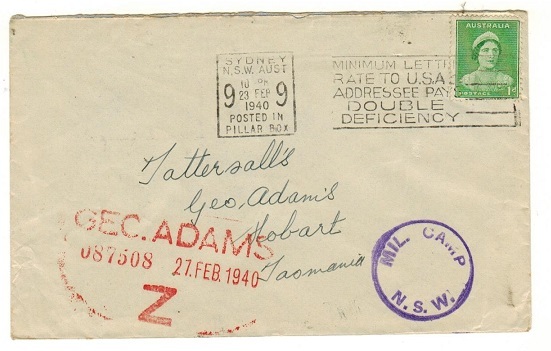 AUSTRALIA - 1944 underpaid cover from TAMBO with 2d+3d 'Postage Dues' added at FORTITUDE VALLEY. 1944 (NO.16.) 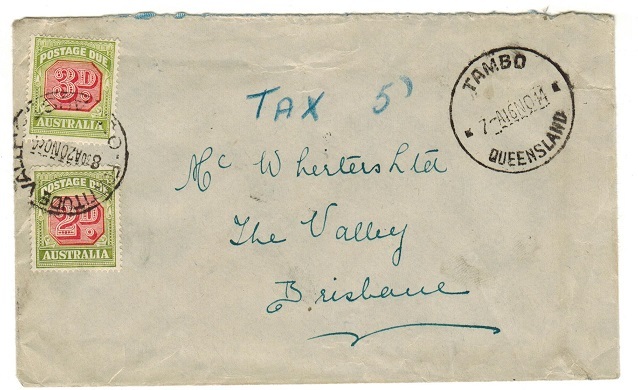 unstampled cover addressed locally cancelled TAMBO/QUEENSLAND with 'Tax 5d' applied in blue crayon and with 2d and 3d 'Postage Dues' added and cancelled FIRTITUDE VALLEY. AUSTRALIA - 1944 underpaid local cover from CHARTERS TOWER with 1d+2d 'Postage Dues' added. 1944 (SE.27.) 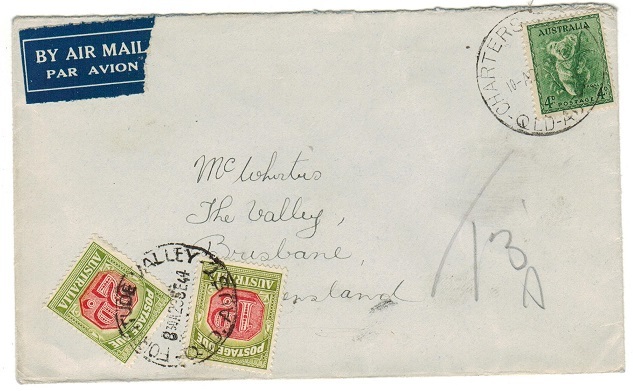 local cover addressed to Brisbane bearing 4d adhesive tied CHARTERS TOWER in Queensland and being underpaid having 'T/3d' applied in manuscript with 1d and 2d 'Postage Dues' added and cancelled by FORTITUDE VALLEY cds. AUSTRALIA - 1924 1 1/2d red PSE used at MORGAN. H&G 19a. 1924 1 1/2d red on cream (blue interior) postal stationery envelope addressed to Adelaide and cancelled by MORGAN/Sth AUSTRALIA cds dated 20.DE.25. H&G 19a. AUSTRALIA - 1920 2d orange PSE used locally at TEA TREE GULLY. H&G 13. 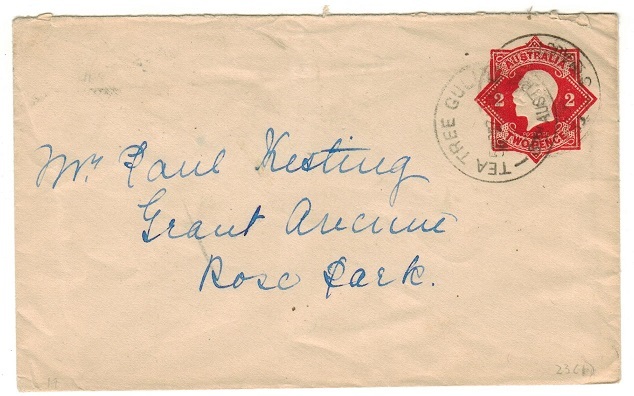 1920 2d orange on cream postal stationery envelope addressed to Rose Park cancelled by TEA TREE GULLY/Sth AUSTRALIA cds dated 7.AUG.25. H&G 13. AUSTRALIA - 1942 'U.S.A.F.I.A./94/PASSED BY CENSOR' cover to USA. AUSTRALIA - 1931 Inward postcard with 'TAX/1d/No.3 SYDNEY' h/s applied. 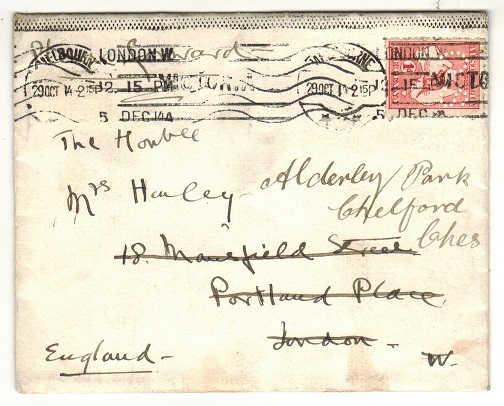 1931 inward underpaid postcard from UK (a little crumpled at left) struck on arrival by scarce red boxed TAX/1d/No.3 SYDNEY handstamp. 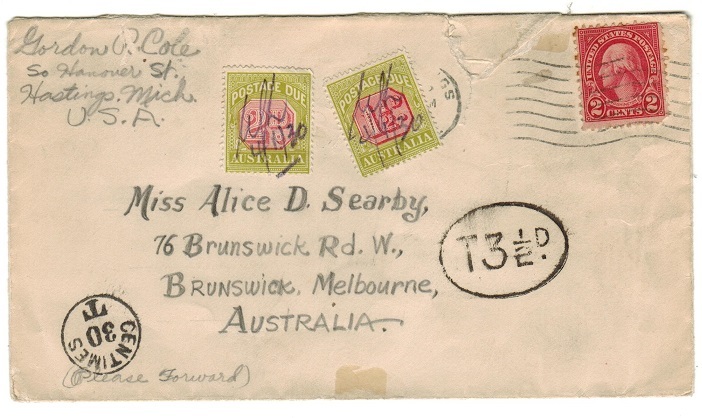 AUSTRALIA - 1941 censor cover to Palestine with INSUFFICIENTLY PAID FOR AIR TRANSMISSION h/s. 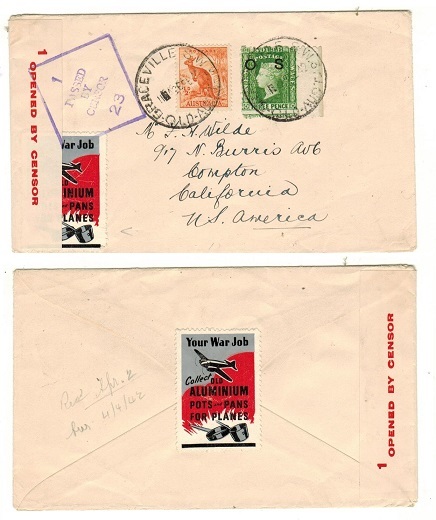 1941 cover addressed to Palestine (a little crumpled) bearing 2d adhesive tied by SHIP MAIL ROOM/MELBOURNE cds and struck on the front by two strikes of the black boxed INSUFFICIENTLY/PAID FOR/AIR TRANSMISSION handstamps. Red on cream 3 OPENED BY CENSOR label on reverse flap and with violet boxed PASSED BY/CENSOR/ V96…… strikes on front and reverse. AUSTRALIA - 1924 inward underpaid postcard with 'MORE TO PAY/1d' h/s applied and postage due added. 1924 inward underpaid postcard from UK struck by black circular MORE TO PAY/1d handstamp and with 1d 'Postage Due' applied (uncancelled). AUSTRALIA - 1930 inward underpaid cover with 'T 3 1/2d' tax mark and postage dues applied. 1930 inward underpaid cover from USA struck by oval 'T 3 1/2d' tax mark with 1 1/2d and 2d 'Postage Dues' applied and manuscriptly dated 4/1/30. AUSTRALIA - 1945 'INSUFFICIENTLY PAID FOR AIR TRANSMISSION' cover to UK. 1945 (JUL.24.) cover addressed to UK bearing 1 1/2d (x2) and 2 1/2d adhesives tied by MELBOURNE roller strike and being underpaid struck on the front by black boxed INSUFFICIENTLY/PAID FOR/AIR TRANSMISSION h/s. 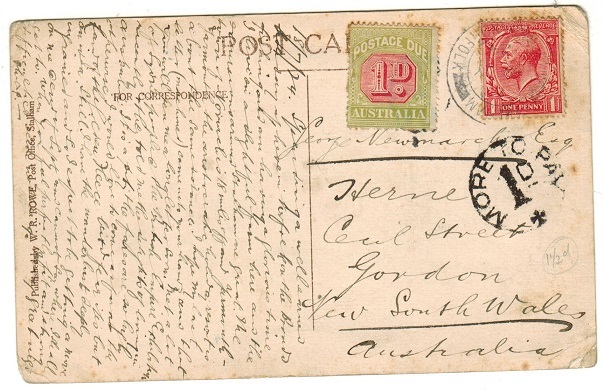 AUSTRALIA - 1903 inward underpaid postcard from UK with '3' tax mark and postage dues applied. 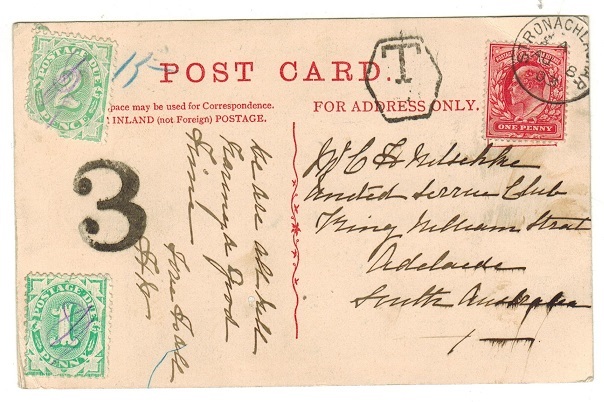 1903 inward underpaid postcard from UK struck by scarce '3' tax mark in black with 1d and 2d (latter fault) 'Postage Dues' applied and cancelled in manuscript. AUSTRALIA - 1933 inward underpaid postcard from UK with 1d 'Postage Due' added. 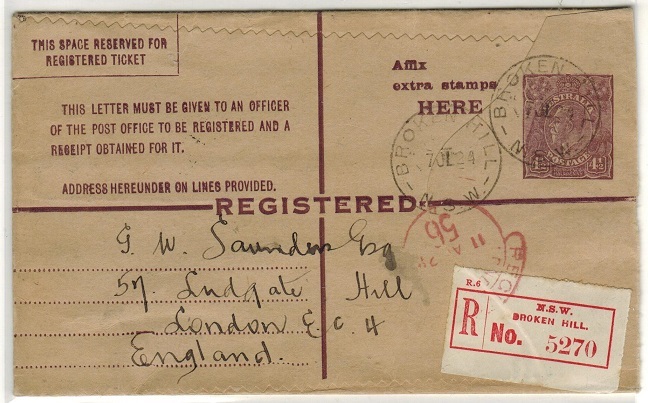 1933 inward underpaid postcard from UK struck by larger oval 'T/1d' tax mark with 1d 'Postage Due' applied and cancelled by manuscript initials. AUSTRALIA - 1930 (circa) inward underpaid postcard from UK with 1d 'Postage Due' added. 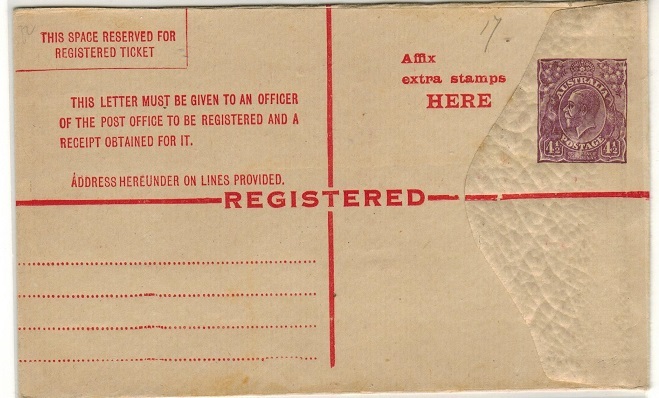 1930 (circa) inward underpaid postcard from UK struck by small oval 'T/1d' tax mark with 1d 'Postage Due' added and cancelled by manuscript marking. AUSTRALIA - 1941 3d rate cover to USA with 3/NOT/OPENED BY/CENSOR strike applied. 1941 (MR.1.) 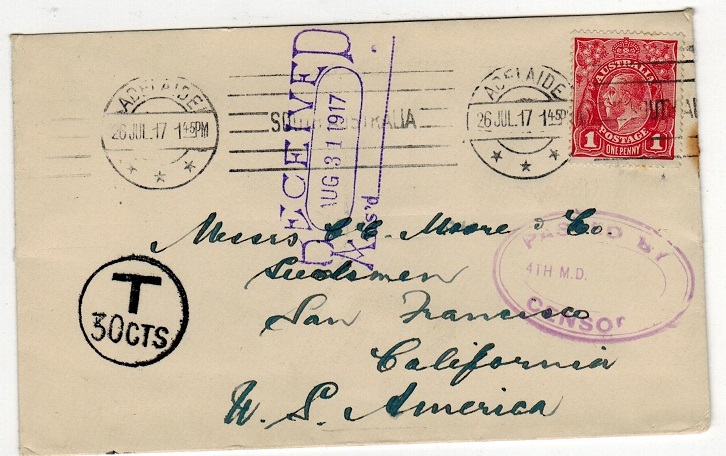 cover addressed to USA bearing 1d and 2d adhesives tied by GLEN IRIS S.E.6/VIC cds and struck by scarce violet 3/NOT/OPENED BY/CENSOR h/s on front with 1d 'Lady Gowrie Red Cross Appeal' label on reverse flap sold to raise funds for the sick and wounded. 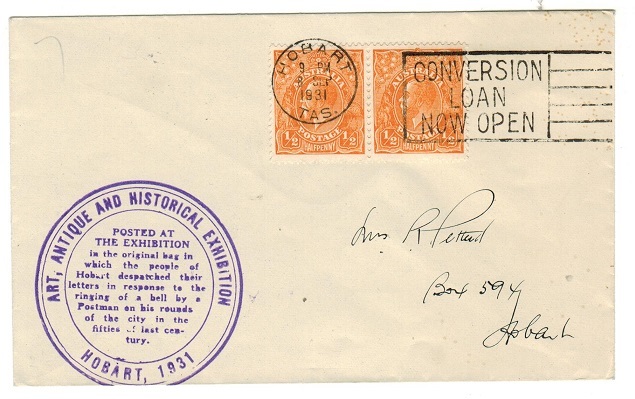 AUSTRALIA - 1940 3d rate cover to Canada with 3/NOT/OPENED BY/CENSOR strike applied. 1940 (NOV.3.) 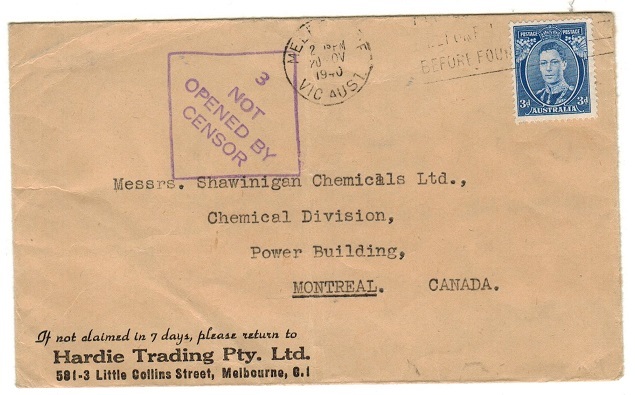 cover addressed to Canada (central fold) bearing 3d adhesive tied by MELBOURNE/VIC roller strike with violet 3/NOT/OPENED BY/CENSOR h/s at left. (Little type H3-9a). AUSTRALIA - 1930 'S.S.Comorin' wreck cover to UK. 1930 (FEB.22.) 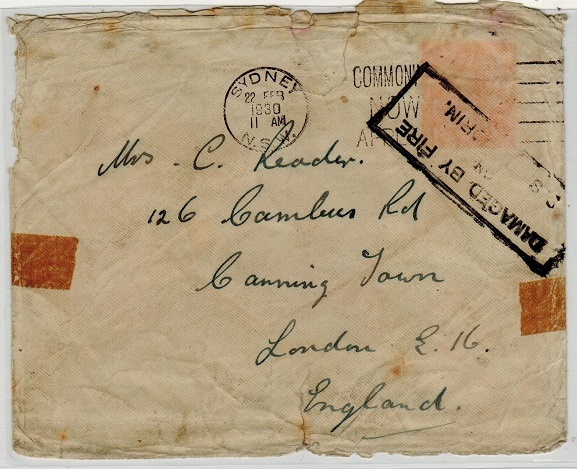 cover addressed to UK sent from Sydney and having been taken on the P & O steamer 'S.S.Comorin' which suffered a fire during its sailing to Colombo and so having a boxed DAMAGED BY FIRE/ON/S.S.COMORIN handstamp in black applied. The original stamp has fallen off and the cover having obvious damage faults. AUSTRALIA - 1947 'B.C.O.F.' multi franked registered cover used at BOFU. 1947 (DE.4.) 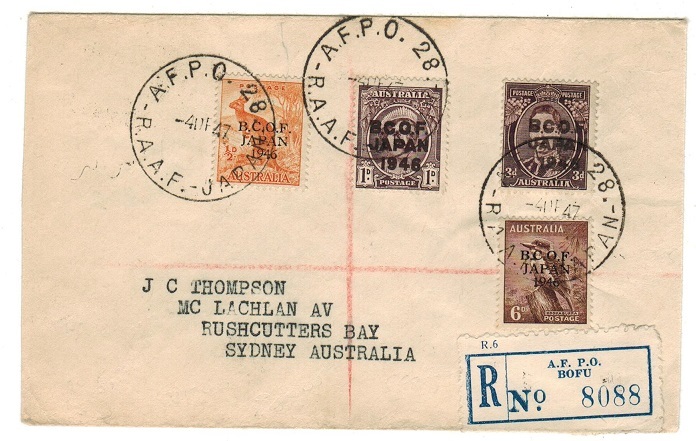 registered cover addressed to Australia bearing 1/2d, 1d, 3d and 6d adhesives overprinted B.C.O.F./JAPAN/1946 (SG J1-J4) tied by A.F.P.O. 28/R.A.A.F-JAPAN cds's with rare R6/R/AF PO/BOFU registered label below. Australian troops in Japan. AUSTRALIA - 1914 1d rate cover to UK used at BOVENVILLE. 1914 (JUL.23.) 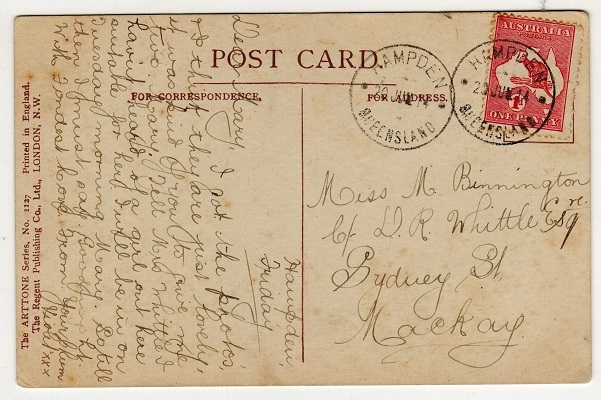 cover addressed to UK bearing 1d red 'roo' tied by s/r BOVENVILLE/QUEENSLAND cds. AUSTRALIA - 1914 1d rate postcard use to UK used at HAMPDEN. 1914 (JUN.20.) 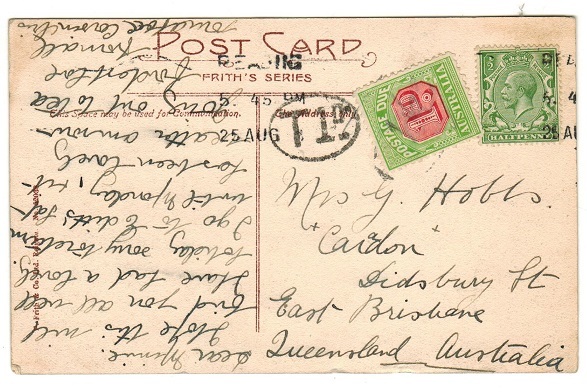 use of comic postcard addressed locally bearing 1d 'roo' tied HAMPDEN/ QUEENSLAND.